A 25-foot gray whale that was found dead will be taken to Bainbridge, Wash. for a necropsy. A NOAA Fisheries official said it appeared skinny. A male adult gray whale has been found dead at the Coast Guard Pier in Elliot Bay. Crews with the Washington State Department of Fish and Wildlife towed the whale toward Whidbey Island where Cascadia Research Collective scientists performed a necropsy Monday afternoon. NOAA Fisheries spokesperson Michael Milstein said the whale appeared skinny. The 39-foot whale’s body was in poor condition with no signs of trauma, according to the initial finding of the necropsy. NOAA said there were no food contents in the whale’s stomach at the time of the necropsy. 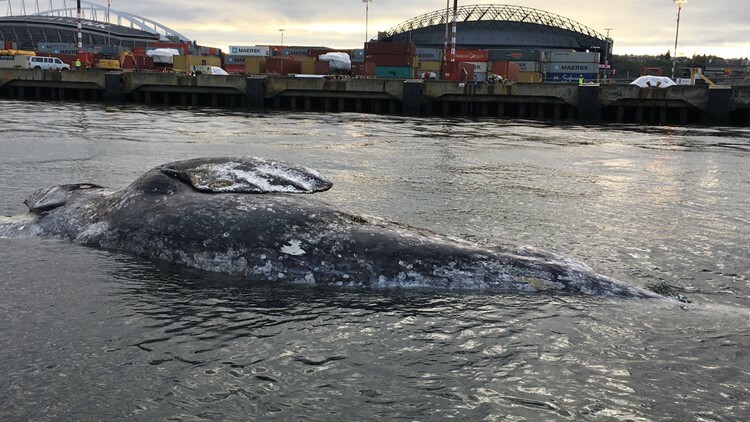 A juvenile gray whale was found dead at the Coast Guard pier in Elliott Bay.